Tether’s USDT, a controversial cryptocurrency, is becoming more and more popular among traders, research from Morgan Stanley finds. Bitcoin trades paired against USDT now make up 14% of bitcoin trading volumes. Tether sceptics have questioned whether the company actually has the US dollars in reserve that it says backs its crypto. A controversial cryptocurrency is becoming more and more popular among traders. Trading between Tether’s USDT, a stable-coin that aims to trade at $US1, is on the rise, according to new research by Morgan Stanley, the US investment bank. Typically, bitcoin trades are paired against the most traded fiat currencies, such as the US dollar, Japanese yen, and the euro. Of course, a person can also trade between bitcoin and other cryptocurrencies. 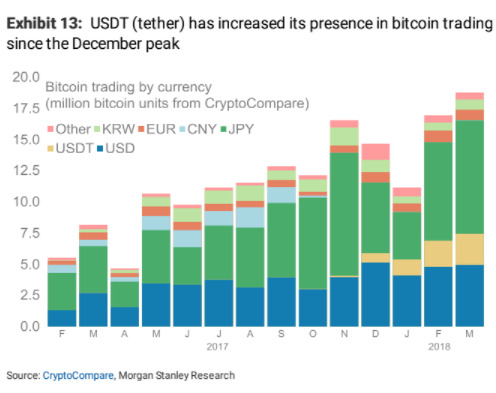 Since the beginning of 2018, however, trades between USDT and bitcoin have become more common, Morgan Stanley found. “During the most recent bear market, USDT has been taking a larger share of trading volumes,” the bank said. The bank, which compiled data from over 350 exchanges, estimates 14.2% of bitcoin trades are paired against USDT, up from less than 1% in October. USDT is meant to function as a stable-coin, a cryptocurrency that allows you to avoid the volatility of bitcoin but still have the operability of a crypto. That’s one reason why the coin’s usage might be on the uptick. Bitcoin has shed as much of 70% off its all-time high near $US20,000 set in December since the beginning of 2018. “Tether trading increases with bitcoin volatility,” Stephen Kade of TrueUSD, a Tether competitor, told Business Insider. 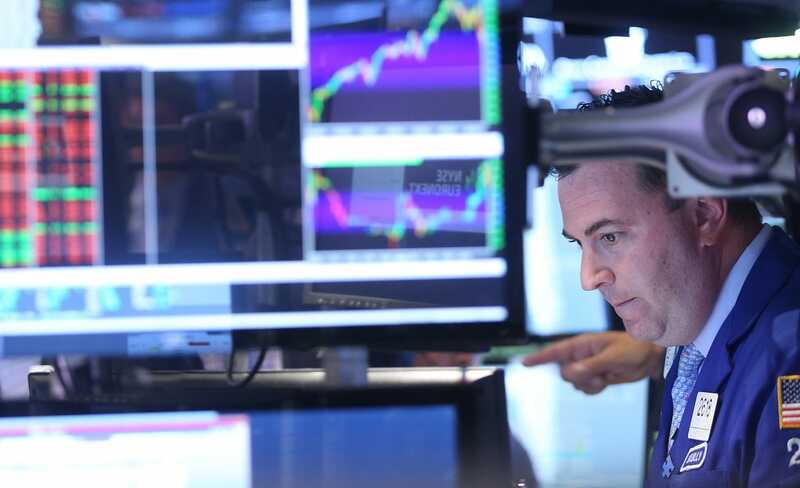 Still, the cryptocurrency is controversial, and Tether has been subpoenaed by the Commodities Futures Trading Commission. Sceptics have questioned whether Tether actually has the dollars it says back its crypto. “[They] still haven’t proven that they hold the funds backing their tokens,” Kade said. Still, two cryptocurrency exchanges, Binance and OKEx, added the cryptocurrency to their venues at the end of 2017. “Both of these exchanges do not accept fiat currencies, so when falling bitcoin prices also led to falling prices in most other cryptocurrencies, traders likely turned to tether due to its price being equivalent and stable to the US dollar,” Morgan Stanley said. Traditionally, a long-bitcoin trader would swap some bitcoin for another crypto during a price free-fall. But lately things have been more correlated. As such, exchanging bitcoin for ether, for instance, doesn’t really help reduce risk.